Four North Reading third-graders took home first place in the annual Toshiba/National Science Teachers Association ExploraVision contest. 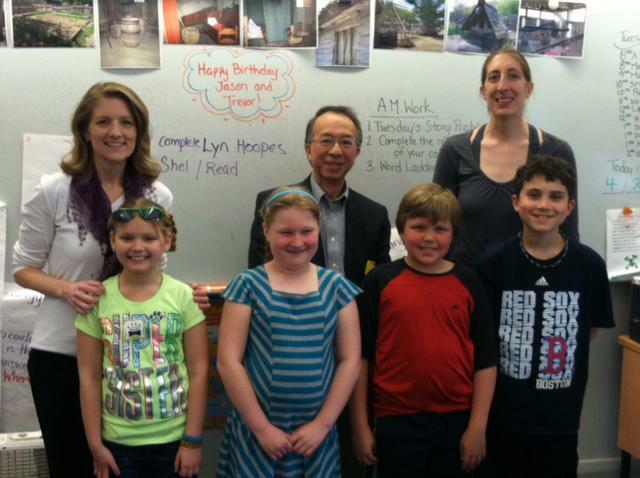 From left, rear: Laura Wall (mentor), Norbert Eng (Toshiba), Elizabeth Dill (teacher/coach); from left, front: Abby Wall, Annika Howe, Harley Duffley, and John Jennings IV. Four third-graders from North Reading’s L.D. Batchelder School learned on Tuesday that they placed first in the K-3 category of the world’s largest science and technology competition, the Toshiba/National Science Teachers Association ExploraVision contest. The 9-year-old students — Harley Duffley, John Jennings IV, Annika Howe, and Abby E. Wall — impressed judges with their SIGHT system project, a futuristic tool that features holographic imaging and a map to help firefighters strategize their life-saving methods and prevent property damage. SIGHT — which stands for Safety, Interactive, Guided, Holographic, Technology — was inspired by Howe’s father, who is a police officer, and the students wanted to help those who work in public service. Howe said her father “is probably going to scream” when he learns of the students’ achievement. “I love how we did it, and I love how this works for two [types of] people: firefighters and police officers,” she said. The students’ teacher, Elizabeth Dill, said she was thrilled with the team’s win, especially because of the idea’s practical uses in emergency situations. “I think it’s a really interesting idea, and given all the events that were happening [during the search for the Marathon bombers], if first responders had all that technology available, maybe it would have made things easier for them,” she said. Now in its 21st year, the number of entries in the ExploraVision contest increased this year with 5,206 team projects produced by 15,963 students from the United States and Canada. Entries were judged on creativity, scientific accuracy, communication, and feasibility of vision. Eric Crossley, the director of science education competitions at the National Science Teachers Association and the competition manager, said that the SIGHT system project stood out in its category. Twenty-four regional winners from various grade levels were notified of their achievement in early March. Each received a Toshiba notebook computer and created websites for their technologies that included a prototype, description, and a video. These websites were the basis for the national judging. Eight teams became finalists in May, and last week, four first-place and four second-place awards were given. As first-place winners, each of the North Reading project members won a $10,000 savings bond in addition to the Toshiba HD camcorders they each received as regional winners. On June 5, the students, their families, their teacher, and their mentor, Laura Wall, will take an all-expenses-paid trip to Washington where they will attend a gala awards weekend, visit Capitol Hill, meet members of Congress, display their work at a science showcase, and sightsee in the nation’s capital. Christina Jedra can be reached at christina.jedra@ globe.com. Follow her on Twitter @ChristinaJedra.